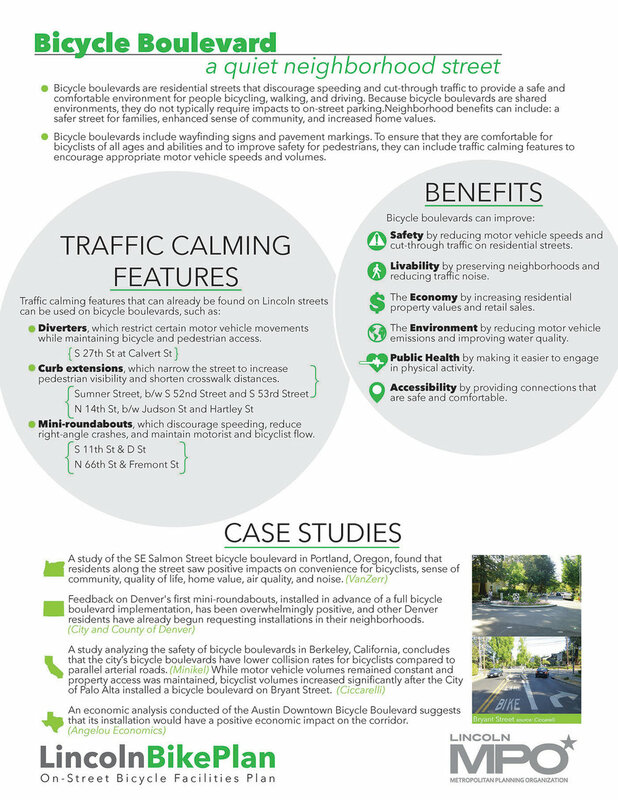 The Lincoln Bike Plan was presented to the City Council at a Pre-Council Briefing on January 28, 2019. To view the full presentation, download the PDF here. To view the full document, download the PDF here. The Lincoln Metropolitan Planning Organization (MPO) is initiating the development of an On‐Street Bicycle Facilities Plan, and the general public’s involvement in this process will be critical to enabling the MPO to make informed recommendations and decisions. This document outlines the public involvement and stakeholder engagement strategy for the On‐Street Bicycle Facilities Plan. This Public Engagement Plan will guide the process and ensure that key stakeholders and the general public are engaged throughout the planning process. As the outreach plan and process will continually evolve, this document provides a framework but is not all inclusive and will be continually updated.